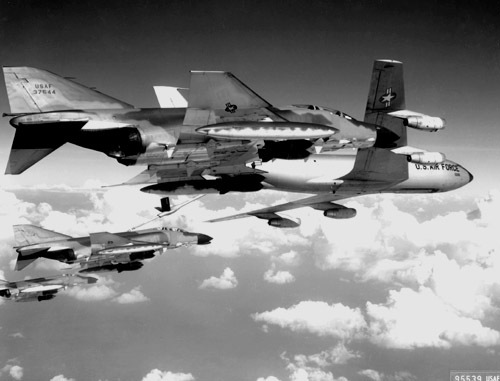 Four AIM-7 Sparrow and four AIM-9M Sidewinder missiles, AGM-65 Maverick missiles, AGM-88 HARM missile capability, and one fuselage centerline bomb rack and four pylon bomb racks capable of carrying 12,500 pounds (5,625 kilograms) of general purpose bombs. The Phantom was the first multiservice aircraft, flying concomitantly with the U.S. Navy, Air Force and Marine Corps. The Phantom was the first and only aircraft to be flown concomitantly by both the Blue Angels and the Thunderbirds. The F-4G "Advanced Wild Weasel," the only model still in the active Air Force inventory, increases the survivability of tactical strike forces by seeking out and suppressing or destroying enemy radar-directed anti-aircraft artillery batteries and surface-to-air missile sites. F-4G's are E models modified with sophisticated electronic warfare equipment in place of the internally mounted 20mm gun. The F-4G can carry more weapons than previous Wild Weasel aircraft and a greater variety of missiles as well as conventional bombs. The primary weapon of the F-4G, however, is the AGM-88 HARM (high speed anti-radiation missile). Other munitions include cluster bombs, and AIM-65 Maverick and air-to-air missiles. The F-4C first flew for the Air Force in May 1963 and the Air National Guard began flying the F-4C in January 1972. The Air Force Reserve received its first Phantom II in June 1978. The F-4D model, with major changes that increase accuracy in weapons delivery, was delivered to the Air Force in March 1966, to the Air National Guard in 1977, and to the Air Force Reserve in 1980. The first F-4E was delivered to the Air Force in October 1967. The Air National Guard received its first F-4E in 1985, the Air Force Reserve in 1987. This model, with an additional fuselage fuel tank, leading-edge slats for increased maneuverability, and an improved engine, also has an internally mounted 20mm multi-barrel gun with improved fire-control system. Starting in 1973, F-4E's were fitted with target-identification systems for long-range visual identification of airborne or ground targets. Each system is basically a television camera with a zoom lens to aid in positive identification, and a system called Pave Tack, which provided day and night all-weather capability to acquire, track and designate ground targets for laser, infrared and electro-optically guided weapons. Another change was a digital intercept computer that includes launch computations for all AIM-9 Sidewinder and AIM-7 Sparrow air-to-air missiles. Additionally, on F-4E/G models, the digital ARN-101 navigation system replaced the LN-12 inertial navigation system. The F-4G 'Advanced Wild Weasel,' which inherited most of the features of the F-4E, is capable of passing real-time target information to the aircraft's missiles prior to launch. Working in "hunter-killer" teams of two aircraft, such as F-4G and F-16C, the F-4G "hunter" can detect, identify, and locate enemy radars then direct weapons that will ensure destruction or suppression of the radars. The technique was effectively used during Operation Desert Storm against enemy surface-to-air missile batteries. Primary armament includes HARM (AGM-88) and Maverick (AGM-65). F-4G's deployed to Saudi Arabia also were equipped with ALQ-131 and ALQ-184 electronic countermeasures pods.